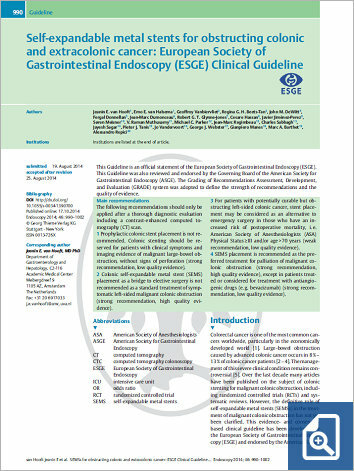 This Guideline is an official statement of the European Society of Gastrointestinal Endoscopy (ESGE). This Guideline was also reviewed and endorsed by the Governing Board of the American Society for Gastrointestinal Endoscopy (ASGE). The Grading of Recommendations Assessment, Development, and Evaluation (GRADE) system was adopted to define the strength of recommendations and the quality of evidence. The following recommendations should only be applied after a thorough diagnostic evaluation including a contrast-enhanced computed tomography (CT) scan. 1 Prophylactic colonic stent placement is not recommended. Colonic stenting should be reserved for patients with clinical symptoms and imaging evidence of malignant large-bowel obstruction, without signs of perforation (strong recommendation, low quality evidence). 2 Colonic self-expandable metal stent (SEMS) placement as a bridge to elective surgery is not recommended as a standard treatment of symptomatic left-sided malignant colonic obstruction (strong recommendation, high quality evidence). 3 For patients with potentially curable but obstructing left-sided colonic cancer, stent placement may be considered as an alternative to emergency surgery in those who have an increased risk of postoperative mortality, i. e. American Society of Anesthesiologists (ASA) Physical Status ≥ III and/or age > 70 years (weak recommendation, low quality evidence). 4 SEMS placement is recommended as the preferred treatment for palliation of malignant colonic obstruction (strong recommendation, high quality evidence), except in patients treated or considered for treatment with antiangiogenic drugs (e. g. bevacizumab) (strong recommendation, low quality evidence).